So what font am I talking about? The Droid Robot Font. The font that will get Android lovers all worked up, I assume. I don’t even have an Android device, but I still think that this font is cool! Take a look up there again. How cute is that? It seems to me that the robot is making gestures in a similar manner as one would when employing the semaphore flag system. However, upon closer inspection – and checking out semaphore formations after eons – the gestures are not the same. Still, the concept is fun! 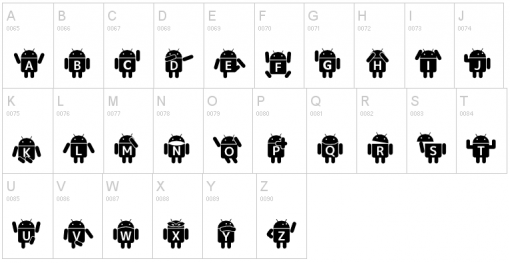 Here is the complete Droid Robot Font alphabet. There is, of course, a set for lower case letters. And here’s the set for the numbers. It does not end there! There is a set for punctuation marks and some common symbols. 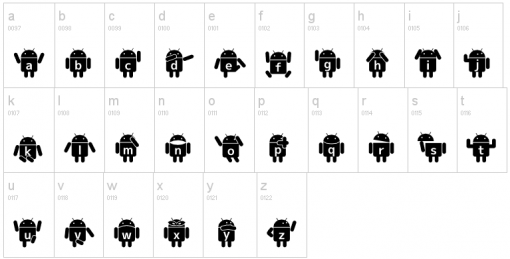 Looking at the entire line up, I cannot help but notice that some symbols that I use regularly are missing from the Droid Robot Font set: the euro sign, the pound sign, and trademark sign. Then again, it’s not such a big deal if you look at the overall concept. It is easy to imagine posters and flyers using the Droid Robot Font, although overusing it might just prove to be a headache. As fun as I think the font is, it does not exactly make for easy reading, does it? Do we have any typophiles out there? What’s your judgement? 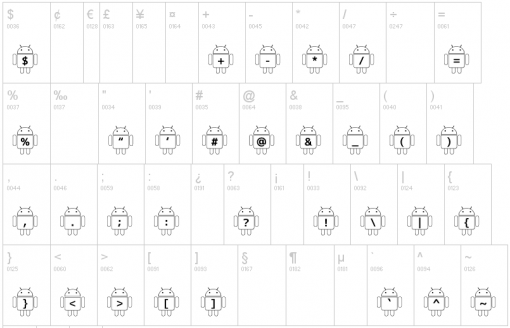 Download the Droid Robot Font for free.